AMSTERDAM, November 29, 2016 – CoolGames, one of the pioneers of HTML5 games, today took part in the launch of Instant Games for Messenger, rolled out internationally by Facebook. CoolGames developed the global arcade favorite Arkanoid to the new service on behalf of owner Taito. 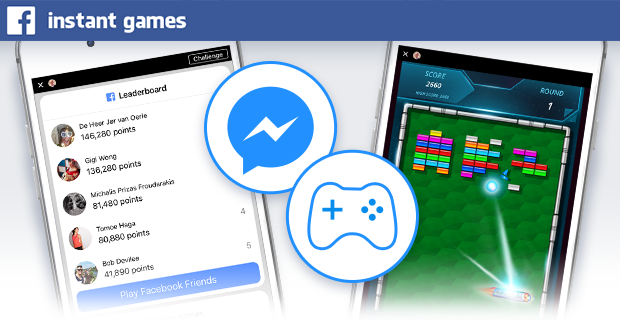 Instant Games lets people play games within seconds on Messenger and Facebook News Feed. The games are built in HTML5 technology and can be played instantly across mobile devices (iOS and Android) and desktop. CoolGames publishes some of the best performing HTML5 games via hundreds of distribution channels worldwide, including many leading game websites and media brands. The first game that CoolGames has developed for Instant Games is an HTML5 version of classic Arkanoid from Taito, who initially released the game in 1986. People can start playing Arkanoid directly through the new Messenger games tab, when they are challenged by a friend or discover it through their News Feed in Facebook. The HTML5 games are fully integrated in Messenger and Facebook and will load immediately, without the need for downloading separate apps. CoolGames plans to launch several new titles for Instant Games in the coming months. Instant Games for Messenger and Facebook News Feed launched across 32 countries, including Japan, the USA, UK, South Korea and Germany, today.